Munchkin’s new thing is kicking me very cheerfully in the bladder. I prefer the other new thing, which is feeling a cluster of movement on my right side and another on my left simultaneously. Not only is it cute and trippy, it gives me a rough idea of munchkin’s size and position. We’re approaching cucumber length, apparently. Kevin has felt munchkin groovin’ about, though it takes some patience and a lot of right timing. I swear munchkin stills when Kevin puts his hand on my belly. I hope he retains that calming effect after baby is born. Wait, I’m nearing the end of second trimester already? Munchkin’s expected due date is less than four months away? When did this happen and HOW COME NO ONE WARNED ME? 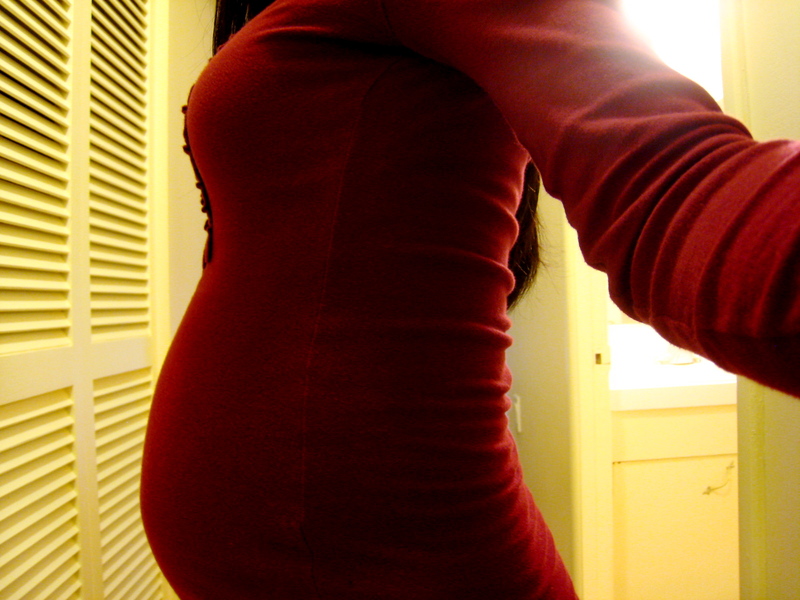 Apparently I only look pregnant in profile, not from the front or back – except that I have no waist now, heh. I’ve seen pregnant women sort of plump up and gain evenly all over, and they look adorable, but I guess I’m not one of those. In fact my joints are still really bony. Especially my elbows. I haven’t noticed any significant difference in hair or nails … I play keys, so I keep my nails short most of the time. They feel weird and uncomfortable when they get too long, but they’ve never been prone to breakage. 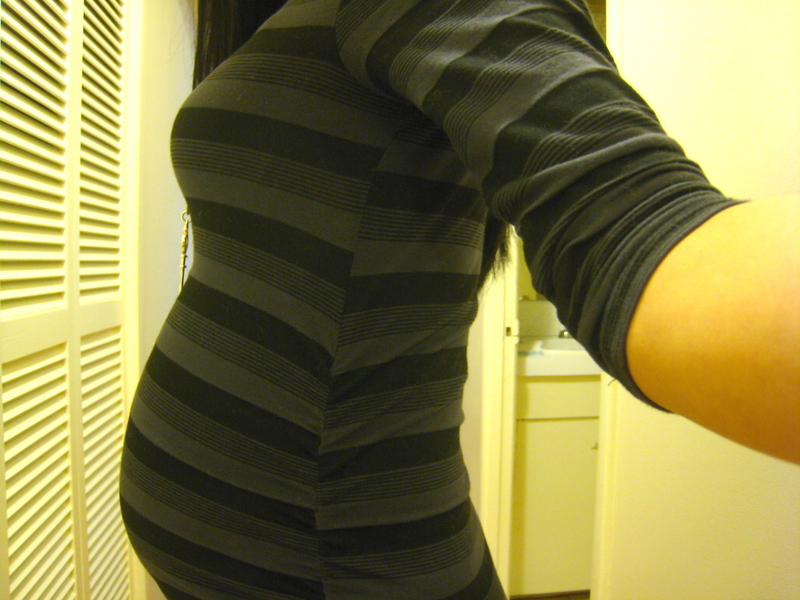 As for hair, I have a ton, and I lose a ton … until second trimester! I don’t plug up the drain every time I shower anymore! And I’m not picking loose strands from my pillow in the mornings! This is awesome, except they say it goes back to normal after delivery, in which case I’ll probably need to vacuum every six hours. Also, my belly button is starting to look very strange. It’s, like, flat and about to pop. For six months Kevin’s been trying to get me to sleep early, without much success. Thing is, I have trouble falling asleep at night. But eventually I do, and then (unless there’s something I need to be up for) I sleep through most of the morning. I’m sooo sleepy and comfortable in the mornings, except that I usually need to pee, but more often than not sleep wins. Hooray for bladder control. The other day, a friend asked me what I thought the weirdest thing about pregnancy was so far. It’s starting to become this extra appendage that interferes with everyday activities, such as sleeping and bending over. It’s foreign, having a bump there. I’m quite fascinated by it. We’re in the “cute bump” stage, I know. In another month or so I may be ginormous and whalelike, and then I’ll have a much deeper understanding of interference. Pregnancy hasn’t slowed me down much, yet. My abs can still handle the extra weight, so I haven’t had to resort to pushing myself up into a sitting position with my arms, etc. Though … I can’t run up three flights of stairs to the skytrain anymore without losing my breath. I can still run across the street to catch a bus without losing my breath, and I know this because it happened today. Thankfully no older-generation Asians were there then to yell at me. As far as extra weight goes, I’ve gained ten pounds, putting me securely in the triple digits for the first time ever. (We don’t have a scale at home, but both sets of parents do.) Ten pounds at 22/23 weeks didn’t sound like much, but at my checkup on Tuesday the midwife assured us it was perfectly normal. She also dashed our hopes of getting another ultrasound. They can’t book one just for gender assessment, which is non-medically necessary, and munchkin is too healthy. The last ultrasound showed an anterior placenta, so maybe that’s why munchkin skipped the whole fluttery thing and went straight to bumpin’ and thumpin’. It feels like a bunny. Some of the bigger moves must be externally visible by now, I just haven’t checked to confirm. And I’m noticing what I think are Braxton-Hicks. You can almost SEE the outline of the uterus then … so much for not being able to find it! Bump update? 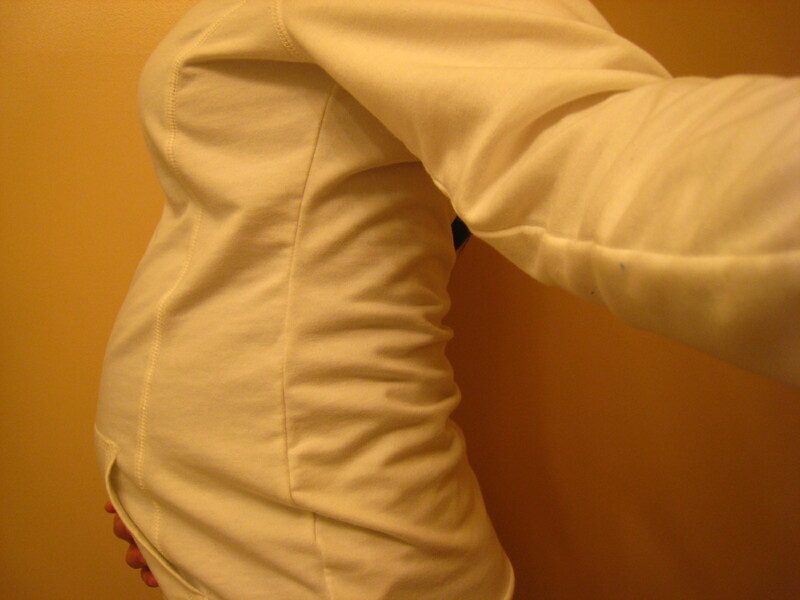 These lo-fi bathroom photos seem to suggest another “am-I-really-getting-any-bigger” phase, but people are finally guessing that I’m pregnant! This is a big deal. No, don’t ask me why, I’m not actually sure. We moved more westward last Saturday, and will be here for at least a year. The place feels kind of like a camp lodge, especially the living space in back. Because there’s a wood-burning fireplace! There are a few draftier areas we still need to figure out, and the bathtub doesn’t drain properly, but other than that we’ve unpacked and settled in. So. Much. Space. It took me the better part of Thursday to vacuum and swiffer the floors, and I think I took two breaks. Pregnancy has made me weaksauce. Though I didn’t much appreciate being yelled at all day on moving day. WHAT? I’m carrying a PILLOW. And a POT. These things will not break my back or cause a miscarriage. No, I won’t attempt to push the bed around, even though it totally needs to be a few inches to the right.